A proper and reliable sump pump alarm system makes sure that you have a device that won’t ditch you during times of urgency and emergency. Having this kind of alarm system is essential, as it can serve as an additional layer for the accountability of your pump. While it doesn’t ensure that you won’t experience flooding on your basement, a reliable sump pump alarm can buy you some time to prevent whatever disaster may happen in your basement. There are various models of sump pump alarms in the market today which are released by different manufacturers. Choosing the best one to buy can be a bit tricky with all these options available. But, it doesn’t have to be a very tough decision. Here are some of the trusted brands and models of sump pump alarms that could work best for you. 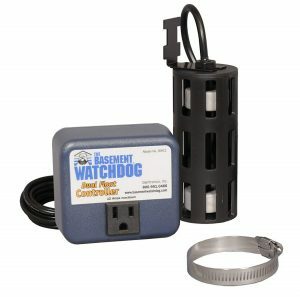 The Basement Watchdog Water Sensor and Alarm from Glentronics, Inc. is designed to be an effective early warning system for your basement. As such, it can give you early warnings of leaks and moisture before any real problem and damage occur in your basement. This alarm system has a very solid and efficient circuitry which takes only a mere 1/32 inches of water before it blares a 110 dB alarm throughout the house. It can detect moisture on the floor before any mold can grow or warn you of an impending flood condition. It has a 6-feet wire sensor that can cover a wide space, but if needed, it can also be extended to as long as 100 feet for hard to reach areas. 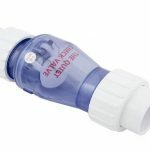 The Basement Watchdog Water Alarm is ideal to use on your basement, under the sink, below the laundry tab or even beside your refrigerator and under your water heater. The alarm system uses a 9 Volts alkaline battery. However, the battery is not included in the package and has to be bought separately. The system has a battery-saver feature which allows working time for up to 24 to 48 months, keeping the batteries fresh for a longer time. The Basement Watchdog Dual Float Sump Pump Switch is ideal for use in simple applications. It is well designed to offer both flexibility and reliability when it comes to sump pump alarms and switches. This sump pump switch is uniquely designed to have two different floats which can offer extra protection and security. 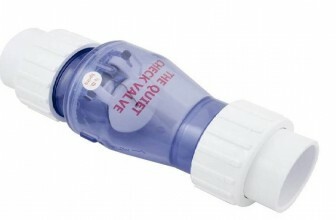 The first and the larger float is effective and sensitive in detecting as little as 1/4 inches of water level rise, making the pump activation automatic and easy. The second float of this alarm system acts as the plan B for whenever the first float fails to activate the sump pump, making the whole system fail-safe. The dual float design of this system makes sure that your sump can be drained effectively. Moreover, the Basement Watchdog Dual Float Sump Pump Switch features a protective float cage which helps prevent any wiring or debris from interfering with the movement of the float. The float cage has a curved and vented bottom design to help keep off any debris buildup at the bottom. The Switch is compatible to use with most sump pumps. If you want to have a fail-safe water alarm system which is guaranteed to turn on during any urgency or emergency, the Basement Watchdog Dual Float Sump Pump Switch is a great choice. The HomeSitter HS-700 Multi-Functional Alarm is the perfect go-to alarm system for home or commercial use with all its alarm functions. This multi-functional monitoring system features a low and high-temperature alarm call-out, power outage alarm, and low battery alarm. In addition, it also has a sensitive water sensor that can send alerts when the system has monitored basement floods, leaking pipes, burst hoses of washing machines, and sump pumps that have overflowed. The HomeSitter HS-700 Multi-Functional Alarm is a perfect primary home protection. If your air conditioning or furnace fails, this alarm system can call up and notify up to three different phone numbers. But aside from calling you during a time of urgency, the system also has a very audible alarm that can be heard throughout your home. This alarm system can be powered through an electric cord, but it requires a backup power supply using two AA batteries which are not included in the package. You will also receive a notification if the backup batteries need a replacement. The great thing about this alarm system is that it is as simple as plug and play which requires no installation at all. 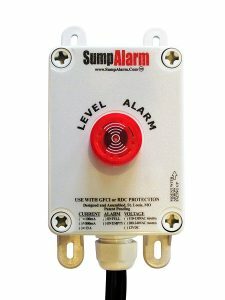 Whether you want to monitor possible flooding events in your basement or even outside your house, the SumpAlarm In/Outdoor High Water Alarm can be very efficient. It can monitor the water level, especially during an urgent situation when the sump pump fails. This alarm system makes sure that you get alerts even before a real disaster happens, giving you enough time to address the issue. The system has a blaring 90 dB alarm which can be heard throughout your home. The alarm system’s horn is directional, so you have to make sure it is facing your home when you are using it outdoors. 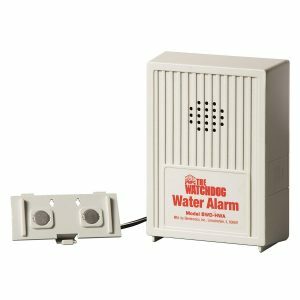 Aside from the audible alarm, the Water Alarm also features a one-inch large LED pilot light that is visible even from a hundred feet away to notify you of a possible emergency. One of the great things about this SumpAlarm is it’s straightforward and quick installation process. It is simply plug and play. All you have to do is connect the cord from the alarm system to a power outlet, and you now have a fully-functional monitoring and alarm system. It also has four-rear mounting holes and mounting feet. The Zoeller 10-4011 High Water Alarm is one of the most reliable, efficient, but simple to use water level rise alarm for home use. 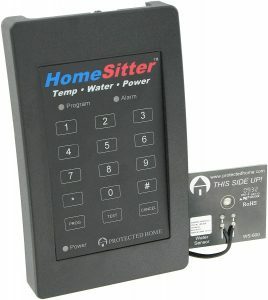 This water monitoring and alarm system is best used for indoor purposes only. 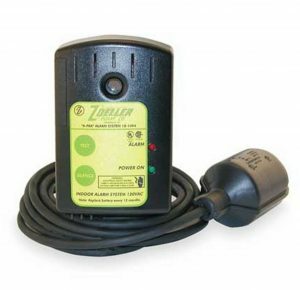 One of the best features of the Zoeller 10-4011 High Water Alarm system is its dual alarm. When the system has detected a high water level rise in your basement, it can give off a blaring 87 decibel sound alarm which can be heard throughout the house. With the volume of this alarm, it may even be heard outside the house. Moreover, it also features a light indicator in addition to its horn alarms. The Alarm runs on a regular power supply. It is quick and straightforward to use as it requires no installation at all. The alarm system is ready to use once it is unboxed. All you need to do is plug it in your power supply output using the 6-feet AC cord included in the package. However, the alarm system will require two AA alkaline batteries as a backup power supply. This will make sure that your high water level home alarm system will still be active and enabled even during situations when the power is cut off or if there are power outages. The good thing is that the system will also notify you when it’s low on battery and requires a replacement. Are you looking for the best sump pump alarms? Sump pumps aren’t always enough to make sure you are ready for an impending disaster.This is why you need a most reliable sump pump alarm system to go with it. Yet, a sump pump alarm system that won’t work as best as it should is just a waste of your money. So, here’s a guide that will help you choose a sump pump alarm that is ideal for you. Your sump pump alarm will eventually get drenched with water. With that, it is essential that you choose a sump pump alarm made of materials that can withstand this kind of situation. Both the housing and the parts of the sump pump alarm system should be made of high-quality materials that won’t corrode. It can either be made of stainless steel, alloy, cast bronze, cast-iron coated with epoxy, or sheet metal. Note that the price of the sump pump alarm may also vary depending on the materials it is made up of. Also, you have to check if the sump pump alarm system is strong and sturdy enough so that it won’t be easily damaged by debris in times of flood. One of the crucial features of a sump pump alarm you have to consider is an automatic switch. A sump pump alarm with a manual control is only useful when you can remember to turn it on before possible flooding occurs. Otherwise, it would be of no use to you. Getting a sump pump alarm with an automatic switch is much more convenient. Having an automatic switch is also useful for protecting your alarm system, as it can prevent the alarm from burning out if it has been running dry for an extended period. To make sure that your sump pump alarm stays working and is fully operational even during storms or flooding when there are power outages, having an alarm with a battery backup is always an advantage. You might also want to pay attention to the length of the alarms power cord. This will serve to be important, especially when you are using it on hard to reach locations where there are no near power supply outlets. Note that you shouldn’t use extension cords with your sump pump alarm. Thus, it is important to gauge the length of the cord you might need. An alarm system that can detect the high water level is already an efficient one. But if your budget allows, having a multi-functional sump pump alarm system can be a great advantage as well. You can have an alarm system that can detect low and high temperature and even power outages. 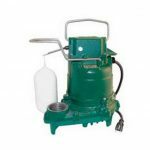 Sump pumps are great when you have to drain excess water in your basement or outdoors. But it is only necessary after the flood. So, what about before the disaster happens? That is why it is a great advantage to have a sump pump alarm system for every sump pump you have at home. With the alarm system, there is a way to notify you of a possible disaster; may it be moisture in your basement before mold starts to grow, leaks in your pipes, or a possible flooding situation. SPC is an Industrial Interest blog where we have tried our best to give a easy snapshot of the Best Sump Pumps Available in the US market based on Price, Best selling and Customer Reviews at Amazon. Sump Pump Center is a participant in the Amazon Services LLC Associates Program, an affiliate advertising program designed to provide a means for sites to earn advertising fees by advertising and linking to amazon.com. Amazon, the Amazon logo, AmazonSupply, and the AmazonSupply logo are trademarks of Amazon.com, Inc. or its affiliates.